On behalf of three Maine families, the Institute for Justice (IJ) and the First Liberty Institute (FLI) have filed a legal challenge to Maine’s exclusion of religious options from the state’s school choice program. IJ represents families from three small “tuitioning towns” in Maine—Orrington, Glenburn, and Palermo—towns where the local school district offers high school tuition payments for students to attend the public or private secondary schools of their choice in lieu of maintaining public schools of their own. However, a state law prohibits those towns from paying tuition on behalf of families who choose otherwise qualified religious schools. Maine’s law blatantly discriminates against parents based on religion, providing some families with tuition support for the school of their choice but denying that same support to other families. The families who filed the lawsuit qualify for Maine’s tuitioning program in all other respects, but they are excluded from participating only because they chose religious schools for their children. Such discrimination is both unfair and unconstitutional. IJ and FLI argue not only that the U.S. Supreme Court has given the green light to include religious options in a school choice program, but that a 2017 Supreme Court decision makes it clear that barring parents from choosing religious options when providing families with school choice violates the U.S. Constitution’s Free Exercise and Equal Protection Clauses. For well over a century, parents in Maine towns that did not operate their own public schools enjoyed the right to select the school—public or private, in-state or out-of-state, religious or non-religious—that best suited their children’s educational needs. The town then paid the tuition to the parents’ chosen school, up to a set amount. But in 1980, the state’s Attorney General issued an opinion concluding that including religious options in parents’ menu of options violated the federal Constitution’s Establishment Clause.1 As a result, the Maine Legislature in 1982 passed the current law that excludes religious schools from the tuitioning system—a law prohibiting towns from paying tuition to any “sectarian” school.2 Maine’s law thus singles out families who choose religious schools, and only those families, for discrimination. The Attorney General’s opinion, though, turned out to be erroneous. In 2002, the U.S. Supreme Court declared in no uncertain terms that there is no Establishment Clause violation if families participating in a school choice program are permitted to freely and independently select private religious schools from amongst an array of both religious and nonreligious options.3 In other words, school choice programs like Maine’s can unquestionably include religious options without running afoul of the Establishment Clause. Yet the state’s discrimination against religion continues. Maine continues to enforce its unconstitutional ban on paying tuition on behalf of families who choose religious schools. The state now argues that just because it could constitutionally pay tuition on behalf of families choosing religious schools does not mean it has to extend tuition payments to families selecting religious options. Excluding families from a public benefit for which they would otherwise be qualified, solely because they have enrolled their children in religious schools, is equally odious. In September, 2002, just months after the U.S. Supreme Court declared that religiously neutral school choice programs that allow parents to freely choose among a wide array of educational options—including religious schools—are permissible under the federal constitution, IJ filed Anderson v. Town of Durham, again challenging Maine’s prohibition against paying tuition on behalf of families that choose religious schools. Sadly, in 2006, the Maine Supreme Judicial Court again rejected IJ’s claims.6 And again, the U.S. Supreme Court declined to review the decision. IJ, however, as the nation’s leading legal advocate for school choice, refuses to give up on Maine’s parents and, with the help of the First Liberty Institute, once again seeks to vindicate their First Amendment right to free exercise of religion and their right to equal protection of the law. This third case is inspired by the U.S. Supreme Court’s recent ruling in Trinity Lutheran Church v. Comer, and we expect the courts to reconsider previous decisions upholding Maine’s exclusion of religious options in light of Trinity Lutheran. This case has been filed in federal, rather than state court, and thus gives our nation’s federal courts the opportunity to make it clear that religion-inclusive school choice programs facilitate, rather than hinder, the religious and parental liberty protections of the U.S. Constitution. With this case, IJ intends to open the full range of educational options to Maine parents who live in tuitioning towns and to establish that states may not exclude religious options from publicly funded school choice programs. Many of Maine’s public school districts, usually because of their rural nature, have too few students to warrant maintaining their own K-12 schools. Paying tuition to the public or private school of the parents’ choice is Maine’s common-sense solution to ensure that towns with small populations can offer an education to all their children. Under Maine law, parents who live in towns without public high schools, and that do not contract with a single high school to educate all of the students in the town, have the right to select the school that best suits their children’s educational needs. The town then pays tuition (capped at the average cost of educating a student in Maine’s public high schools8) to the public or private school that the parents choose. Parents who live in “tuitioning towns” are free to pick a school that is either public or private, in-state or out-of-state—but they are prohibited from participating in the tuition-payment system if they choose a religious school. The 1903 law was the precursor to the tuition system that exists today. The practice of paying the tuition of students who live in towns without their own public school has served the state well. It continues to provide excellent educational opportunities for students living in rural parts of the state, empowering parents to select the educational environment that best suits their children’s unique educational needs. IJ and FLI represent three married couples from Maine. Dave and Amy Carson are residents of Glenburn, Maine, and have been since they were married 22 years ago. 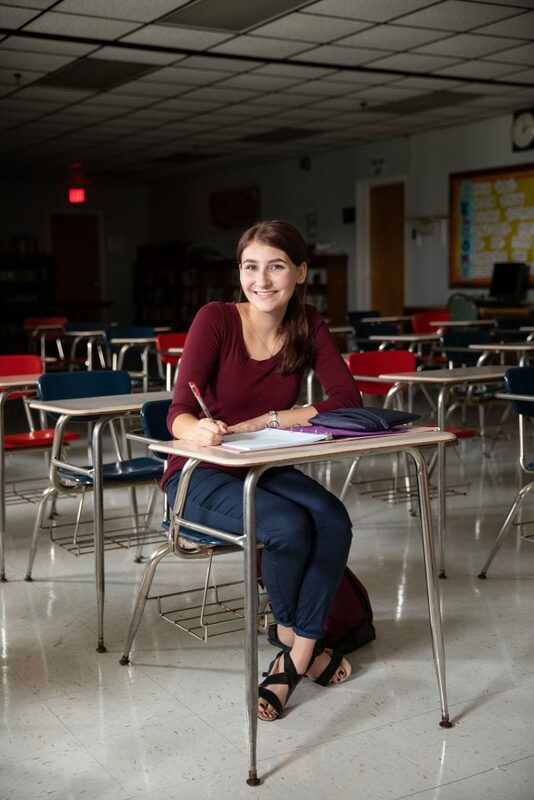 Dave and Amy have sent their daughter, Olivia, now a sophomore, to Bangor Christian Schools—which serves kids from K-12 grades—for her entire school career. The Town of Glenburn is prohibited from paying for Olivia’s tuition because Bangor Christian Schools is a religious school, even though Glenburn pays tuition on behalf of its other residents who select non-religious private schools for their children. Alan and Judy Gillis have lived in Orrington, Maine, a tuitioning town, for 25 years. Their youngest daughter, Isabella, is currently a junior at Bangor Christian Schools. Isabella has previously attended public schools, but Alan and Judy chose Bangor Christian because the school’s worldview aligns with their sincerely held religious beliefs. If the Gillis family had selected a non-religious private school for Isabella, the Town of Orrington would pay her tuition to the private school. But because Alan and Judy have chosen a religious school for their daughter, Maine prohibits the town from paying Isabella’s tuition to Bangor Christian Schools. Troy and Angela Nelson operate a small family farm in Palermo, Maine that has been in the Nelson family for generations. They have two children, Alicia and Royce. Alicia, a sophomore, currently attends the private, non-religious Erskine Academy, while Royce, a seventh-grader, attends Temple Academy, a private, Christian school located in nearby Waterville. Royce will continue to attend Temple when he begins high school, but because Temple is a religious school, the Nelsons will not be eligible to receive tuition from the town for Royce’s tuition, even though they do receive tuition for Alicia while she attends Erskine Academy. The lead IJ attorneys in this case are IJ Senior Attorney Tim Keller, who oversees the work of IJ’s educational choice team and who litigates school choice cases nationwide, and IJ-TX Managing Attorney Arif Panju, who has successfully defended school choice programs in Alabama and Louisiana. IJ’s co-counsel at FLI is Associate Counsel Lea Patterson. Joining IJ and FLI as local counsel is Jeffrey T. Edwards, Esq., of the Portland firm of Preti, Flaherty, Beliveau, Pachios and Haley. IJ is also currently challenging the exclusion of religious options from Montana’s private school scholarship program and Washington State’s post-secondary work study program. IJ recently successfully defended a school choice program in Puerto Rico on behalf of parents and children who desperately need educational alternatives and also represents parents defending school choice programs from constitutional attack in Florida.